The discovery was made by FOSS Patents' Florian Mueller, who said he found the document "in a place where few people look for this kind of information," with the "change of control" stipulation holding that patent licensing deals from any of the companies involved in the agreement will be terminated unless otherwise specified. 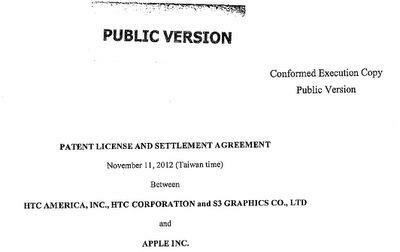 When HTC entered into the deal, it brought with it subsidiaries S3 Graphics and VIA technologies, both of which were asserting claims against Apple. Mueller noted that change of control clauses are not unusual in such situations, however they are not always automatic, as is the case of the Apple and HTC deal. According to the filing, the U.S. dismissals of existing litigation are without prejudice, meaning that the parties can possibly reassert their claims if the arrangement goes sour, or one of the companies is purchased. Due to Apple's dominant market position, it is unlikely to be bought out anytime in the near future, so the clause clearly skews toward protection against a possible takeover of HTC or one of its subsidiaries. Under the deal, such a move would not be beneficial to the new owner as Apple is theoretically able to reassert claims. Other details unearthed from the document revealed that "certain" patents are deemed "covered," meaning that if such properties were licensed to third parties, they would remain encumbered if the agreement were to be terminated. The redacted version does not clarify what the patents are, or what "covered" truly means regarding patent rights, however Mueller believes that the definition is very inclusive. While the 30-page document shines some light on the closely guarded licensing deal, more information may be revealed if Samsung is granted its motion to compel Apple to provide an unredacted version. The move is part of post-trial proceedings in the landmark Apple v. Samsung case, with Korean company looking to sway the court's decision to ban certain products by citing specifics in the Apple-HTC deal.